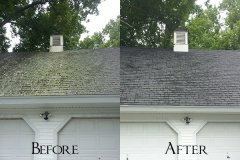 There are a number of algae, lichen’s, molds and moss that can affect the appearance and longevity of your asphalt shingles but the primary culprit in our region is “Gloeocapsa Magma” which is a black mold that causes those ugly black stains and streaks on a roof. 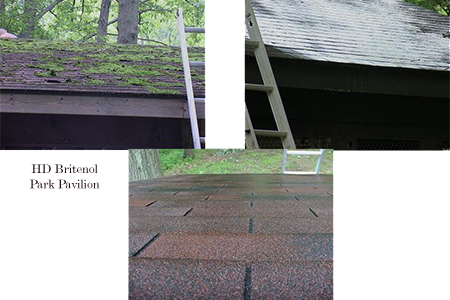 We also see algae, lichen and other molds and mildew. If left untreated these growths may impact the integrity of the shingle as well as its efficiency and overall appearance of the home. 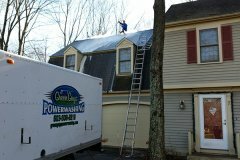 In some instances a homeowner may think their roof needs to be replaced but in most cases a thorough cleaning revitalizes the appearance while adding additional years to its life. 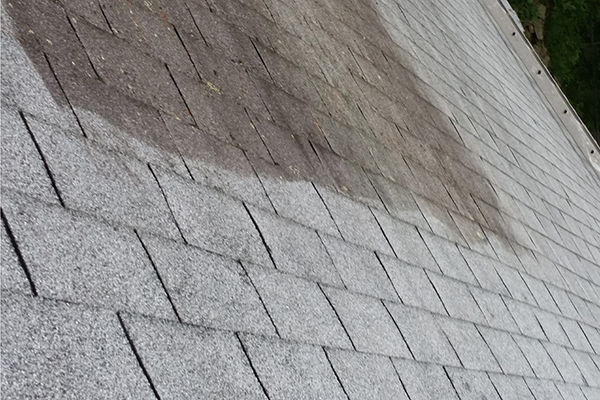 Once we evaluate a roof and identify the cause of the growth we offer our customers two roof cleaning solutions, the first being the more expensive but results are immediate. 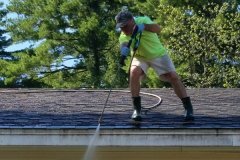 We apply an application of a proprietary roof cleaning solution to the asphalt shingle from a ladder just below the roof line which begins to break down or eat away the streaks and stains. 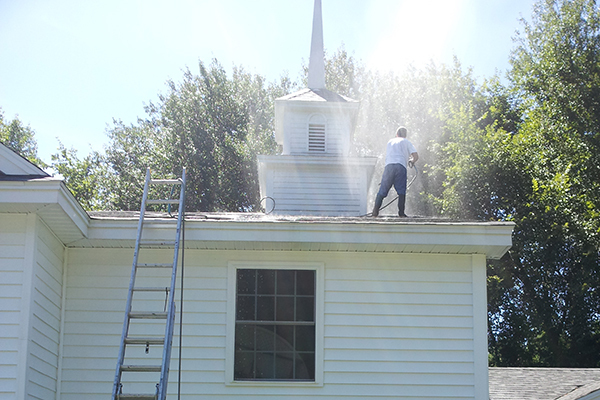 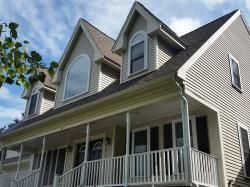 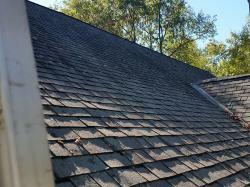 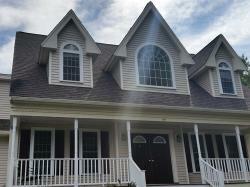 We allow approximately one hour for the roof cleaning solution to penetrate the asphalt shingle. 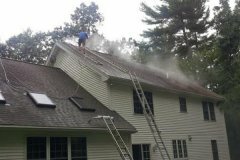 The second part of the cleaning is a thorough rinsing with hot water and very low pressure to ensure there’s no structural damage to the shingle. We attach padded ladders to the peak of your roof and rinse away any remaining stains and the soiled water. We always cover vegetation including flowers, shrubs and grass prior to the cleaning if a home doesn’t have gutters in place. 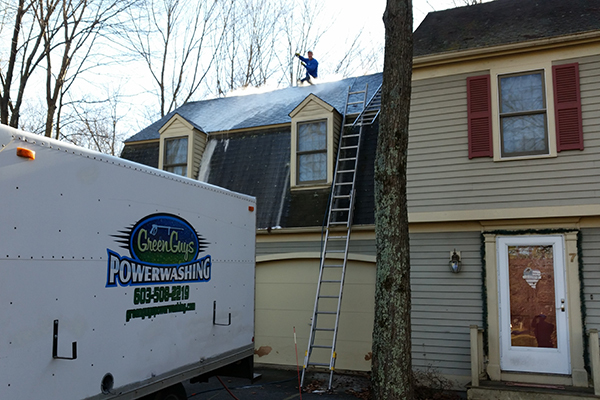 Before leaving we’ll give the exterior and windows a thorough rinsing to wash away and potential debris. All purpose cleaner has a concentrated formula that cleans the exterior surfaces of your house without the need for potentially damaging pressure washing or brushing techniques. In fact, no rinsing is required. Just let mother nature do the rinsing for you! 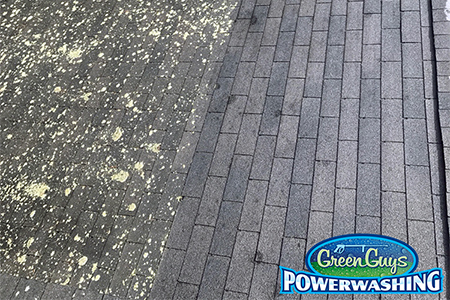 Its non-corrosive, non-caustic, non-acidic formula is biodegradable and eco-friendly and is designed to penetrate and dissolve stains caused by mildew, mold, algae, moss and lichen from all exterior surfaces such as all types of roofs, shutters, siding, decking, fences and more. 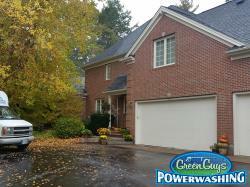 Makes up to 10 gallons and cleans up to 2,000 sq ft. Free of bleach, lye, acid, phosphates and heavy metals. 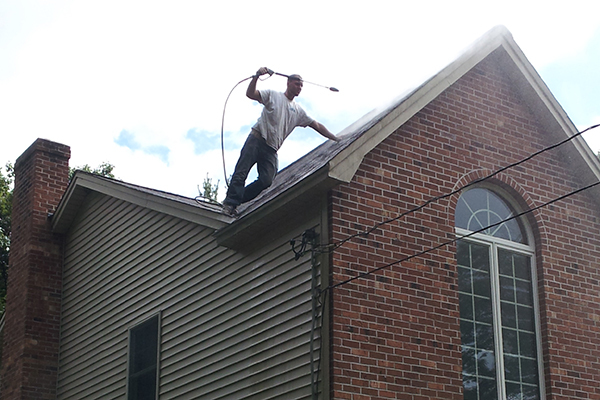 Works on all exterior surfaces. 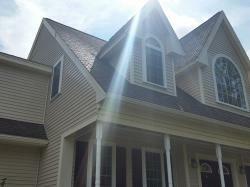 We guarantee results after 60 days or we repeat the process for no charge! 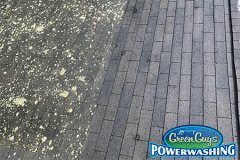 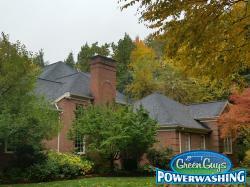 Green Guys Power Washing is fully insured!